Baking some cookies is like a happiness therapy. Freshly baked cookies and some Ginger Tea is all I need to pep me up! 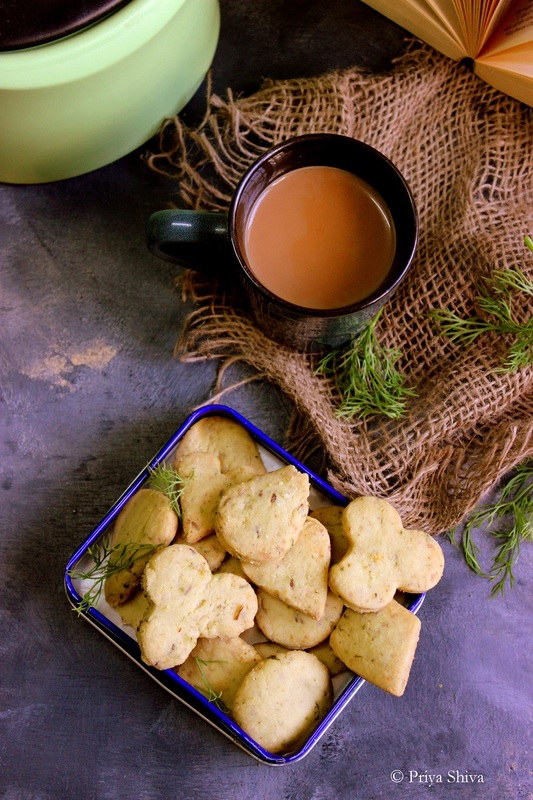 So, I baked these Eggless Dill Leaves Masala Cookies which turned out to be so delicious and perfect partner for my cup of tea..
You can watch this quick video to make these Eggless Dill Leaves Masala Cookies. 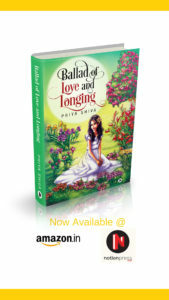 Do read the complete recipe before trying it out.. 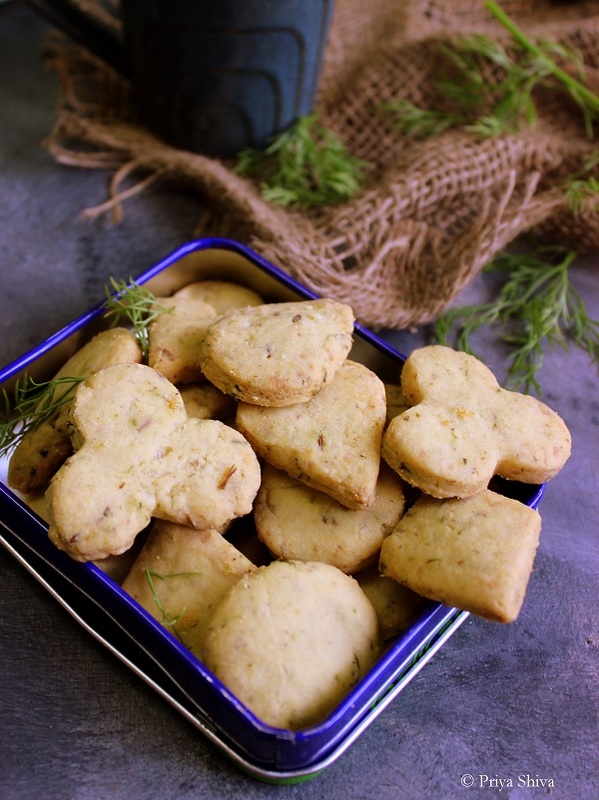 These Dill Leaves Masala Cookies are flaky, buttery and you will love the flavors in it. 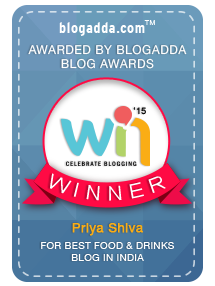 I have shared masala cookies earlier on my blog. This is another version of masala cookies and now my personal favorite! So, do try it out and share your feedback with me..
Preheat oven at 180 degree Celsius. Sift all purpose flour and keep it aside. Roast Cumin seeds in a small frying pan on low flame for a minute. Add green chilli, dill leaves in your blender and blitz it. Keep this spicy mixture aside. Add butter and salt, sugar in a bowl and mix it well. Now add all purpose flour, yogurt, spicy mixture, roasted cumin seeds, baking powder and mix well with your hands to make a soft dough. Roll the dough evenly and using cookie cutters, cut out the cookies. Place it on cookie tray. Keep at least ½ inch distance between each cookie. Place the cookie tray for baking at the same temperature and Set the timer for 20 minutes. When they start turning golden brown, remove from the oven and place them on wire rack for cooling. When they have completely cooled down, store them in an air-tight container. These look amazing! I’ve never tried masala cookies before but I would be so interested in making these! Thank you for sharing your recipe. Very cool that it has dill in it too!